Announcing the 2017 Pacesetter Award Winners! Stevie is well-regarded in not only the special needs community, but as a tireless and mission-oriented businessman who just happens to have a genetic condition that requires a wheelchair. 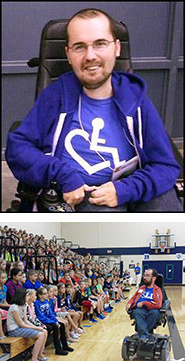 Along with his sister Annie, he started 3E Love, a Chicago-based screenprinting and pride clothing company which promotes their symbol of acceptance, the wheelchair heart logo, and strives to change the perception and social model of disability. Its mission is to EMBRACE diversity, EDUCATE society and EMPOWER each other to love life (hence the name 3E Love). In 2009, Annie unexpectedly passed away and to honor her memory, Stevie used his background in marketing, internet social networking and music apparel to grow the small business into a highly successful company reaching all 50 states and over 20 countries. Stevie's enthusiasm, spirit, and passion are infectious, as he lives his trademark- Love life. Smiles for Students is a student-led club at Northville High School that was created so that students with special needs would have an after-school group they could belong to and find community in. It was started by special education teachers in partnership with neuro-typical high school students as a way to care about fellow classmates with disabilities. It meets twice a month and typical activities include scavenger hunts, animal therapy, field trips and much more... all with special needs students paired with buddies. They also facilitate a lunch bunch system, community outreach programs, and an all-school inclusive dance and carnival that is epilepsy safe and sound sensitive. Over the years, their little club of 20 members has grown into a successful group of over 150 members- making such an impact on many lives and setting a great example of care and inclusion in high school. Dr. Pape is a neonatologist and clinical neuroscientist from Toronto, Canada, who has spent her career advocating for children with special needs to get MORE… more treatment options, more therapy and more HOPE. Her vast study of neuroplasticity has shown that the baby brain is capable of not only improving, but sometimes healing itself. She published a book, “The Boy Who Could Run, But Not Walk; Understanding Neuroplasticity in the Child’s Brain” which pushes clinicians and parents to fight for more and believe in a cure for some and progress for all. Dr. Pape has lectured widely and conducted over 200 training workshops and conferences for parents, therapists, and physicians throughout North America and internationally in 12 countries. Her ground-breaking work has changed the lives of a multitude of children and families and is sure to have an impact on countless more. Chris Ulmer, special education teacher from Florida, felt his students could really flourish and grow if only they felt accepted. He had them write stories from their perspectives and started a series of books called “Special Books by Special Kids”. Rejected by more than 50 publishers, but un-deterred in his mission, he and his wife Alyssa took to social media starting a non-profit and a Facebook page @SpecialBooksbySpecialKids. They now travel the country interviewing people of all ages, abilities, and diagnoses with equal enthusiasm and love in order to give them a chance to shine. You can feel the connections he makes and the impact he is having- by accepting them whole-heartedly but also by “normalizing” interaction with them and showing that it is not only easy to engage a person with a disability, but IMPORTANT. With more than 500 videos on his SBSK YouTube channel and over a million followers on Facebook, he is sharing his message and belief that there is good in the world and there is a loving place for everyone. With 7,999 followers and growing, the Reynolds family effectively and effortlessly share their trials and joys of raising a child who has cerebral palsy on social media. 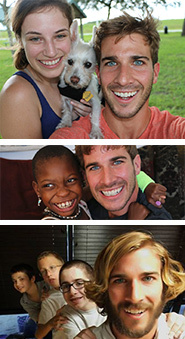 Their daughter, Brookie, is a celebrity among its members, as is big brother, Tyler. The closed group on Facebook is for all to vent, cry, laugh, and brag- all while knowing it’s a safe place to do so. They share stories, pictures and videos and give positive feedback to help everyone in the group. The Reynolds family’s motto is ‘Impossible is Nothing’ and they started this page for families to not feel alone, to know they can all be strong in the hardest of times, and that life can still be beautiful even with so many hardships. Their Facebook group is such a huge source of support, information and community… a go-to for many families with children having CP.